Grifter: Most Wanted is a prime example of how much influence an artist can have on a series. What starts out as a surprisingly enjoyable action-thriller under the pen of CAFU becomes becomes awkward and stilted once artist Scott Clark takes over. No little of the credit or blame can be given to writer Nathan Edmonson, but if one guesses the script remains static throughout, then it seems two different artists' interpretations lead to two different results. 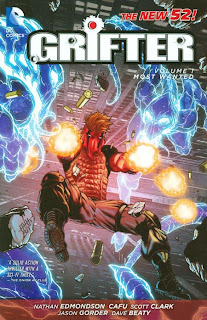 In his bright red, devilish mask, Grifter is perhaps the most recognizable of the Wildstorm properties outside of The Authority -- his mere appearance suggesting a sort of in-your-face edginess. For those readers concerned that the integration of Wildstorm into the DC Comics New 52 would usher in an era too grim and too gritty, Grifter's ongoing title would be the prime site of that concern. Whatever Grifter's adventures may have been before, however, Nathan Edmonson writes an immediately-relatable, action-packed title in the vein of Lost or The Matrix. Cole Cash is an ex-soldier and con man more-or-less minding his own business when he runs afoul of the alien Daemonites; now he's on the run from the Daemonites, who are everywhere and look like human beings, and also from the regular police and super-hero community who think the Daemonites that Cash kills are just regular people. This carries the audience along fairly swiftly through the first chapter and into the second. Most notable is the scene where Cash can stop only a moment in a roadside diner before a Daemonite disguised as a policeman comes along and tries to kill him. There's shades of television shows like Heroes and The Event here, but surely Edmonson taps into a deep vein of precedence -- there's just a pause and then Cash is on the run again, this time with his Special Ops brother on his trail. The third chapter, CAFU's last, ends with a fight between Cash and the Daemonites on a fiery highway, and a startling helicopter crash with a personal cost to Cash. The panels are detailed, and while the action -- broken into panels -- must necessarily be choppy, CAFU presents enough of each scene to make it all run smoothly. Fans of artists Gary Frank or Joe Bennett will find much to like. With the fourth chapter, however, a good bit of that detail falls away. Scott Clark's panels use a kind of computer-generated background that is "detailed," in the sense that it's there, but appears more wooden than CAFU's. The action is stilted, as on the fifth page when guest-star Green Arrow shoots at Cash and Clark draws an entire panel simply to depict that Cash has turned around; and plenty of space is wasted, as on the three-panel page where Cash just rolls over on the hood of a car. This kind of thing continues through the fifth chapter and into the sixth, where Cash is prisoner on a Daemonite ship. Clark depicts Cash's girlfriend with her shirt ripped nearly open, a bit of sexual gratuity that stands out and seems sloppy. The climactic battle between Cash and the Daemonite Carver is hard to follow -- all the Daemonites look the same, so it's difficult to know whether Cash has attacked a key opponent or just a foot solider, and also Clark's perspectives often make it necessary for characters to speak from off-panel, muddling who's standing where and doing what. Some of this certainly must originate with Edmonson. In the sixth chapter he introduces rogue Q-Corp employee Sofia Cardon to help Cash find the Daemonites inside Green Arrow's company. Cardon is all sorts of stereotypes, however, from Clark sexualizing her just as a matter of course to Edmonson finishing her sentences with "guapo" and "compadre" as an incessant reminder of her ethnicity -- and then Edmonson kills Cardon unceremoniously two issues later. Possibly she is meant to demonstrate the quick passing of people in and out of Cash's life, but her initial lazy characterization makes the character's death not moving, just weird. In the penultimate chapter, Edmonson has one more guest star, Stormwatch's Midnighter. Clark's pencils complicate things again -- in one panel Cash and Midnighter seem to stand face-to-face, but in the next they're separated by a gulf; and with truly few background details, it's hard to comprehend the nature of the Daemonite artificial intelligence that Cash seeks here. Further, this issue would seem to tie in to the last chapter of Stormwatch: The Dark Side, in that the Stormwatch headquarters exploded and their kidnapped Daemonite AI gained some sentience. But neither story not art differentiate well between the Daemonite ship that Cash has just escaped and the fragments of the Stormwatch headquarters, nor does Midnighter's presence seem to correspond to a scene from the Stormwatch trade. In essence the audience can guess how the two titles coincide, but just as easily Midnighter could be an angry guy who beats on Cash for a while. As the DC New 52 line continues to hype the Daemonites' presence on Earth, one might expect the ties between the titles to be stronger than this. Grifter: Most Wanted starts out strongly, promising the kind of thriller the DC Universe didn't offer previously, and makes a good argument for what the Wildstorm characters bring to the New 52. But with the book's visual changes come tonal changes, and it's a shame because Nathan Edmonson starts out with a good thing. Rob Liefeld takes over next, which will cause many fans no lack of concern; what's positive is that Liefeld's issues should give Grifter more focus and bring the line-wide Daemonite threat to the forefront, for those who like that sort of thing. We're going to jump ahead a bit here and turn to a new release next, Aquaman: The Trench, and then look for Demon Knights and Batman and Robin coming up soon! Sounds like an okay read, but way too gritty to me. I really enjoyed this one. And I also prefer CAFU's art. I'm not familiair with the Wildstorm characters. Stormwatch's New 52 is my first acquaintance with them, but Midnighter was annoyingly hardheaded on killing Grifter. Still, a good trade!